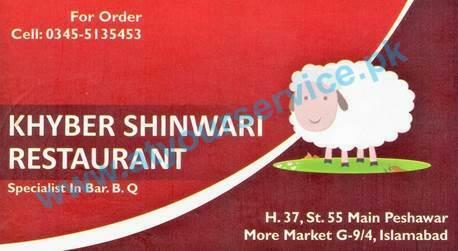 Khyber Shinwari is located at Peshawar Mor, G9/4, Islamabad. It is a Fine Dine and Take Away Restaurant. This restaurant serves tastes from the native Shinwari food. Food is made in salt and pepper. The menu includes proper Pashtun style Dumba Damphkht, BBQ and Karahi.